Anita Desai is a writer who needs no introduction. I first heard her speak at a conference I was presenting at in Chicago in 2007. I had read her books and was charmed by her prose, but was truly taken with her Audrey Hepburn like personality and style, which are a perfect fit with the elegant prose she writes. 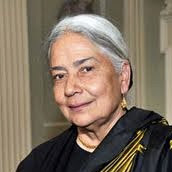 Born to a German mother and an Indian father on June 24, 1937, Anita Desai spent much of her life in New Delhi. Growing up she spoke German at home and Hindi to friends and neighbors. She first learned English when she went to school. It was the language in which she first learned to read and write, and so it became her literary language. When asked why English remains her literary language, she said, "I think it had a tremendous effect that the first thing you saw written and the first thing you ever read was English. It seemed to me the language of books. I just went on writing it because I always wanted to belong to this world of books" (CLC). 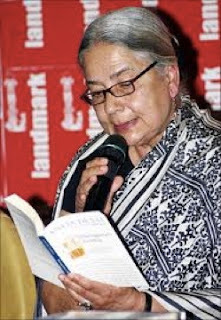 Desai received a BA in English Literature and graduated with honors from the University of Delhi. She started publishing her work shortly after her marriage to Ashrin Desai on December 13, 1958. Desai is part of a new literary tradition of Indian writing in English which dates back only to the '30s or '40s. She explains that this is because "at one time all literature was recited rather than read and that remains the tradition in India. It is still rather a strange act to buy a book and read it, an unusual thing to do" (CLC). Her new style of writing is also different from that of many Indian writers, as it is much less conservative than Indian literature has been in the past. For these reasons, she says, she is not widely read in India, mainly in Indian universities if at all. Throughout her novels, children's books, and short stories, Desai focuses on personal struggles and problems of contemporary life that her Indian characters must cope with. She maintains that her primary goal is to discover "the truth that is nine-tenths of the iceberg that lies submerged beneath the one-tenth visible portion we call Reality" (CLC). She portrays the cultural and social changes that India has undergone as she focuses on the incredible power of family and society and the relationships between family members, paying close attention to the trials of women suppressed by Indian society. Desai is praised for her broad understanding on intellectual issues, and for her ability to portray her country so vividly with the way the eastern and western cultures have blended there. She has received numerous awards, including the 1978 National Academy of Letters Award for Fire on the Mountain, the first of her novels to be brought to the United States. The story is of a remote, isolated woman and her equally withdrawn great-granddaughter as they are forced together in hills surrounded by violence and fire. In 1983 she was awarded the Guardian Prize for Children's Fiction for The Village by the Sea, an adventurous fairy tale about a young boy living in a small fishing village in India. She was awarded the Literary Lion Award in 1993, and has also been named Helen Cam Visiting fellow, Ashby fellow, and honorary fellow of the University of Cambridge. In addition to her writing, Desai has raised four children: Rahul, Tani, Arjun, and Kiran. She has been a member of the Advisory Board for English, and of the American Academy of Arts and Letters, as well as a Fellow of the Royal Society of Literature. She has also worked as an educator at colleges including Mt. Holyoke, Smith, and Girton College at Cambridge University. In the first week of January 2012, Suprose will feature a Tête-à-Tête with this prolific writer. Don't miss this Tête-à-Tête to find out how to enter a giveaway and win one of three copies of - The Artist Of Disappearance by Anita Desai, her latest collection of three fabulous novellas.